Your Wedding day is certainly one of the most important days of your life and we are here to ensure that it goes just fine – at least with respect to transportation tantalization. If you’re confused between a classic vintage car, an unfashionable funky vehicle like a VW Beatle, camper-van, a brand new automobile like a Mercedes, something special like a horse-drawn carriage or a Limo, have no fear, for your best option is right here. 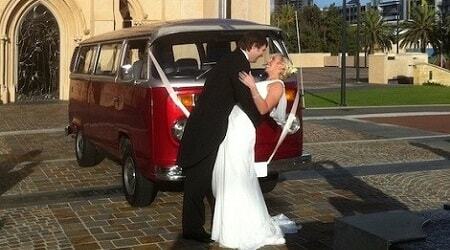 Kombi Hire Perth is the perfect destination for you to hire an amazing wedding car for your special day and make it even more memorable, all of the other vehicles out there have been done before. We have a wide range of luxury Kombis where you can choose your desired car from. Decorate your wedding motors the traditional way with simply a “Just Married” sign on the lower back, a car ribbon on the front, luxury inside and of course not overlooking the champagne. We strive to give our customers the best services for the best price. If you’re looking for a well experienced and friendly driver in the most comfortable and head turning car, Kombi Hire Perth is the right place for you. We’re the Kings of Cruising for a reason, and we would love nothing more than to help contribute to your spectacular day.